So Long Hawaii. Hello Freedom! After twenty-five years in Hawaii, Cheryl Ambrozic dreamed of long distance travel. After selling almost everything, she moved to the U.S. mainland and into a Phoenix Custom Camper – full-time. Don’t miss Scrappers! If you woke up this morning and realized that you had a burning desire to live in Hawaii for a year, what would you do? In your dreams you’re hiking Hawai’i Volcanoes National Park, marveling at the Polynesian Cultural Center, and exploring the history of Pearl Harbor. Oh, Hawaii! Due to the total life disruption such a move would present, not to mention the extensive research and costs involved, most of us would say, “That sounds wonderful, but it’s not going to happen”. Reality, we might tell ourselves, doesn’t allow for such foolishness, or extravagance. Naturally, you would be right. Moving to Hawaii for a year would be very risky, expensive, and who knows what might go wrong. But – if Hawaii truly was your dream – would it be something you later regretted? Having met hundreds of people who have dared to chase their life dreams, the answer is almost certainly, “No!” It’s the things we dream of doing, and don’t, that we end up regretting. While I’m sure most of us aren’t burning to live in Hawaii for a year, we understand the urge for a bigger life adventure, and rarely regret having followed through. Which brings us to Cheryl Ambrozic. At the age of twenty-five, Cheryl moved to Maui from Seattle. Twenty-five years later, she found herself longing return to the U.S. mainland, drive long distances, and explore off-road destinations in a self-contained truck camper. Summoning the courage, Cheryl sold her Maui home and almost all of her possessions, ordered a Phoenix Custom Camper sight unseen, shipped her truck to Seattle, flew over to pick it up, and then drove to Denver to get her camper. Her plan; live full-time in the Phoenix, and look for a new place to settle. And you thought a year in Hawaii was a big deal. TCM: Tell us about your camping experiences and lifestyle over the years. Did you go tent camping or RVing when you were growing up? Cheryl: Growing up in Seattle, my parents took us five kids camping around Washington, Idaho, and Montana. They had a baby blue station wagon pulling a small camper. It was so much fun and seeded my love for camping for the rest of my life. When I was old enough, I camped by myself and with my college friends. I always had a camping box in my car and was ready to go when time permitted and the weather was warm. At the age of twenty-five, I moved to Maui. After a few years I bought 2001 Volkswagen Eurovan camper. I sold it five years later and regretted it, so I looked for another Volkswagen Eurovan. Then, I bought a 1993 Volkswagen Eurovan Weekender that didn’t have a stove, refrigerator or the storage that the 2001 had, but it worked and allowed me to camp at in my favorite surf spots in east Maui. I always loved tent camping, but I felt safer at night when I was snuggled inside my camper and not in a tent. I lived on the south side of Maui on the dry side of the island. Haleakalā National Park and some state campgrounds are on the east side. I could take the Eurovan over to the east side where all the waterfalls and tropical areas are located. That’s where I fell in love with the idea of being self-contained. TCM: We have readers in Hawaii, but have never heard of someone with a truck camper in Hawaii. 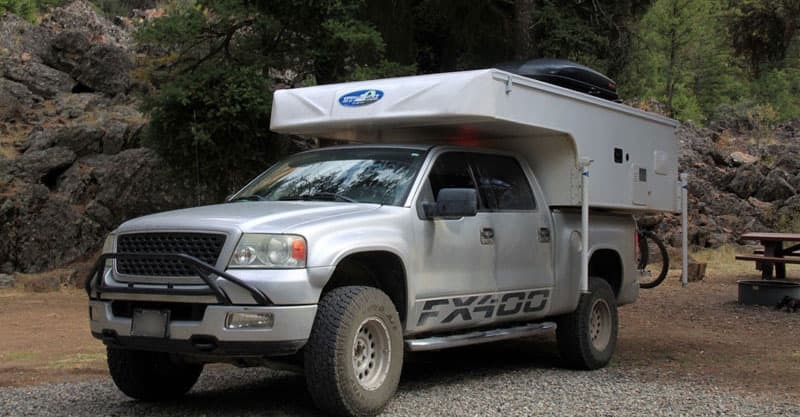 During your twenty-five years in Hawaii, did you ever see a truck camper? Cheryl: Not in Maui. You hardly ever see an RV in Maui, and the ones you do see are old. Maui has really narrow roads with sharp turns. It’s not conducive for an RV. Also, getting RVs to Hawaii is hard. There are no dealerships, they are not promoted, and they would be very expensive. Just to ship a car to Hawaii is a couple thousand dollars. Home » Lifestyle Stories » So Long Hawaii. Hello Freedom!